Zalmon Gilbert was born in Ephratah, Fulton County, New York on April 10, 1845 to a farming family and the only son in a family of five children. His father died in 1853 and the farm operation was turned over to his oldest sister Amy E. and brother-in-law Giles McCallister. In July 1861 at the age of 16, he joined an independent militia from Illinois led by a captain named Graham. He lied on his enlistment papers claiming he was born in 1841 rather than 1845. That September, he was taken prisoner during a siege of Lexington, Missouri, was paroled, and discharged from the militia. The following spring, he enlisted with Company H of the 59th Indiana Volunteer Infantry, served for eleven months (which included a siege of Farmington, Tennessee), and was discharged due to a heart condition. He returned to Fulton County New York after the war through at least 1870 where he rejoined his widowed mother Margaret and sisters Anna M, Jane M and Emma Ida and farmed there. He apparently met and married a woman from Vermont, and turned the family farm over to another sister an brother-in-law, and left the state. He would eventually turn to a new career as a photographer, although it is unclear how he picked up the trade. During this period, he paused long enough in the Joliet, IL area to establish a studio. Joliet was and still is home to large historic Federal and state penitentiaries. A November 1875 carte-de-visite photo of Willis D. Mason entitled "Prison Baby" is featured in a national traveling exhibit on Black History sponsored by the George Eastman House Photography and Film Museum from this period in his career. 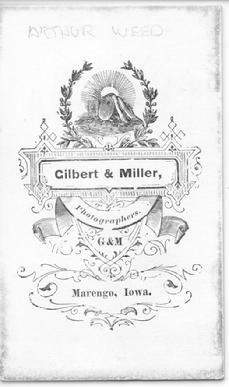 Gilbert partnered with Alice C. Miller in a photography studio in Marengo, Iowa where they practiced for several years. Gilbert and his first wife divorced prior to 1880 while living in Iowa. With 14-year old son James in tow, he relocated to Mandan in 1881. Miller and her husband Clarke, a news reporter, joined them in Dakota Territory. 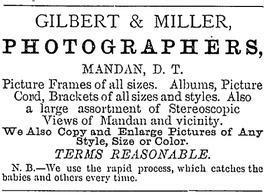 They established Gilbert and Miller Photography Studio in November 1881. In 1885, Alice and Clarke Miller she moved back to Iowa (her native state). There the marriage ended, although it is unknown as to whether Clarke died or if they divorced. In any case, she moved back to Mandan and married Gilbert in early 1893. Tragically, however, she became seriously ill after the move and died a few months later on March 24, 1893. He advertised himself as a �practical photographer� who had photographs of the town of Mandan and the nearby Heart River for sale in his gallery. Gilbert lived and worked in Mandan for the rest of his life, which ended on January 21, 1897 after a brief struggle with a digestive disorder and a severe cold. He was originally buried in Greenwood Cemetery south of Mandan, but was later moved to the Union Cemetery when it was established in 1902. His son James W. Gilbert (b. August 1866) was married, divorced and remained in Mandan at least through 1900 but relocated to New Salem continued the family business by establishing his own photographic studio there. More notable work are "cabinet cards" and "carte de visite" photos of Native Americans taken in his Mandan studio. Dependant on content and condition, today these snapshots of history routinely sell at ephemera auctions, sometimes from hundreds to thousand of dollars. In the era of dime western novels, demand "out east" for artifacts from the western frontier was so great that other photographers flocked to the area and set up studios in Fort Yates (Orlando Scott Goff) and Bismarck (David Barry).